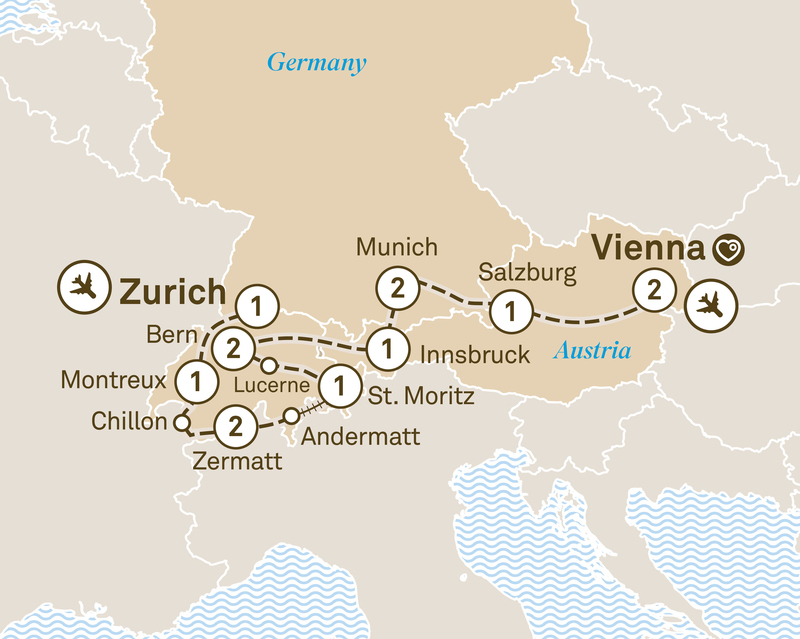 Experience the historical, cultural and culinary delights of Germany, Switzerland and Austria on a luxurious 14 day journey from Zurich to Vienna. You’ll find that the magnificent Swiss Alps will inspire and astound, discover the majestic Alpine region of Europe on your luxury escorted journey. There’s something hauntingly beautiful about Europe’s snow-scattered mountains, whether you’re venturing through picture perfect Switzerland, or traversing wild and wonderful Austria. From the gigantic and jagged Matterhorn to the arresting landscapes and plunging gorges that you’ll witness first-hand whilst travelling on Switzerland’s world-famous Glacier Express, you’ll find every aspect of your alpine adventure exhilarating. After exploring Europe’s great urban centres, there’s nothing quite as wonderful as breathing in fresh alpine air, and while there may be bigger mountains elsewhere in the world, they don’t come any more beautiful, or any more dramatic than the peaks you’ll witness here. Welcome to Switzerland’s largest city, Zurich, where you’ll start your journey with an overnight stay. This morning, visit the elegant Bahnhofstrasse and see the Romanesque Cathedral. Then, leave Zurich behind and journey to Gruyères en route to Montreux, where you’ll enjoy your overnight Special Stay. Cruise on Lake Geneva to Chillon Castle and enjoy a guided tour. Board a cog-wheel train to the Swiss Alps village of Zermatt. Check into your hotel for your two night stay. Ascend the Swiss Alps by rail to Gornergrat, for magnificent views, including the Matterhorn. Alternatively take a guided hike through majestic mountain scenery. This morning drive to Andermatt where you will board the Glacier Express for a spectacular rail journey through the stunning Swiss Alps, before arriving in St. Moritz. End the day with a two night stay in Bern. Journey to Lucerne, and enjoy a walking tour of the Old Town including the Chapel Bridge, followed by a picturesque cruise on Lucerne’s lake to the village of Vitznau. Join the oldest cog-wheel train in Switzerland for a breathtaking ascent of Mount Rigi. Leave Switzerland bound for Austria. Visit the Austrian town of Seefeld and enjoy a horse-drawn carriage ride, and treat yourself to the famous Austrian dessert, apple strudel. On arrival to Innsbruck, enjoy a tour of the city and visit the Bergisel Ski Jump tower for breathtaking views over Innsbruck before arriving at your hotel. Travel through towering peaks to Hohenschwangau to see the majestic spires of Neuschwanstein Castle, which you’ll also visit. Later follow the Romantic Road to Munich for a two night stay. Explore the streets of Munich on a walking tour. Visit BMW World and Museum. Alternatively, discover the haunting history of the Dachau Concentration Camp on a guided tour. Visit the Eagle’s Nest, located in the Bavarian Alps, then continue to Salzburg where you’ll visit locations used during the filming of ‘The Sound of Music’, as well as Mozart’s birthplace and residence. Tonight, stay in Salzburg. Delight in the spectacular scenery as you venture into the Salzkammergut district, made famous by ‘The Sound of Music’. Continuing on to Vienna you will check into your hotel, your base for the next two nights. Your expert local guide will show you the city’s imperial glory during your guided tour. Then visit the Silver collection in the Hofburg Museum. Tonight, enjoy a concert of classical music at the Kursalon, a beautiful Italian Renaissance Palace, followed by dinner. Depart after breakfast. Vienna may be the end of your journey but it will be the start of a lifetime of wonderful memories.